Re: What animals did you put onto your three blank cards? I haven't filled in the blank cards,but if I did ,one would be a badger. These cards of celtic times,and the badger is a native animal and has close infinity with the Celtics.i wonder why it was never included in the first place. Hmm, that's a good point. I don't think we have badgers here, so I'm not too familiar with them. I know they're aggressive though, lol. I believe we have wolverines though, which are from the same taxonomical family… I saw one once while camping much further north and they're pretty grumpy and mean. I live in Northern California. But, I do know they have them in the UK, so that is interesting that they're not part of the oracle deck set. For my three cards, I chose the snail because I've learned lessons about patience and perseverance from watching them. The dolphin and whale have always displayed/expressed to a sort of spiritual source of animism to my spiritual self; that's why I put those two in. I once got to interact with a dolphin pod while surfing in the Monterey Bay in Central California. I know there are whales off of the shores in the UK - I don't know if there are dolphins though… It seems a bit cold for them. But perhaps there's a dolphin other than the typical bottle-nosed dolphin of the tropical waters that's native to the UK area. yeah the badger is similar as a wolverine, fears nothing.Very much a creature of the earth and nocturnal,a very pro family. I think my other cards would be a toss up with the bird the Swallow , a great traveller and forever busy, the stoat (same family as badger and wolverine) but rather element of earth they would be fire. As fast ,decesive movements, for ever busy and a true mighty atom,a real tiny ball of energy. Oh yeah! I remember now… When I was a child, in illustrated children's books, whenever you'd see a badger, it always had a little family with it, lol. I didn't realize that that was an actual thing/behaviorism for that animal until you just mentioned it. Are badgers and wolverines in the same taxonomical group as weasels, ermines and opossums? I haven't used the three blank cards but I have redefined some of the existing cards for example we don't have otters here and I have never seen one so for me if I draw this card I call it the platypus card. Similarly, the stag I think of as the kangaroo card. It's just about making things more relevant to me. This relates to you other post about the wren card. You said you don't have wrens where you live. Once you understand the wren meaning you will most probably identify it with a bird that is more local to you. Badgers are in the same family but not the same sub-family as Wolverines. Badgers aren't that aggressive really, if trapped or threatened then they can be but on the whole they bumble around doing their own thing. Badgers are omnivorous. Stoats are in the same sub-family as Wolverines and as carnivores are similarly aggressive, although very rare in the UK as they had been hunted by gamekeeprs/farmers into extinction in many part of Britain. The funniest thing about Stoats is the mad dance they do that hypnotises rabbits, until they can catch the rabbit. If I ever got the time and energy to do the three blank cards, I'd go with the gerbil, the chicken, and the T-rex. I'm down to two blank cards currently. My husband set his drink on my altar; the rabbit tipped it over. I didn't realize it had leaked into the drawers, but recently discovered one of my blank cards was moldy...I'm thankful that was the only one(I also have a few other decks in the drawers as well). I've thought about associating local animals for some of the creatures I haven't experienced, just to see what I come up with. It might be a fun project. Crinia, have you ever thought about doing a deck with the Australian animals? I've got one with some Australian animals around here, though it also has some Asian and African animals in it as well. Tons of stoats around here.Normally hunting the young rats as well as rabbits. Anyway, I think my artwork wouldn't do the cards justice. Crinia, have you ever thought about doing a deck with the Australian animals? I've got one with some Australian animals around here, though it also has some Asian and African animals in it as well. One day Aphritha. 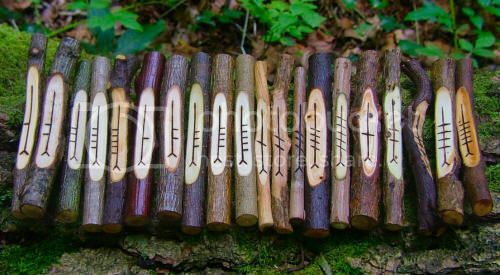 At the moment I am matching Ogham trees from the UK to Australian trees and I have found all but two. In Uk we have mink,pine martin ,polecats, ferrets(which I own),stoats and weasels. They get smaller in that order. Interesting! I know what mink, pine martin, ferret and weasel are - people here have ferrets for pets actually… Not my favorite critter though because they have a stink gland like a skunk, and even if deodorized, they still have this salty smell that never really washes off. They're neat though… They walk funny and are totally limp when you pick them up and sleep in miniature hammocks, lol. They're illegal though. They're considered an exotic animal and a threat to the environment if they were to ever get out from an owner's home and start breeding… Plenty of people have them regardless though, and skunks too. Oh whoops… I just noticed you said you had one for a pet. I guess I just told you a bunch of stuff you already know then :p I added you to my friends. I'm curious, when you add someone to your friend list, does it send a request or add the other person back to their list as well? How many ferrets do you have? Do they live in a hutch/cage, or do they use a litter box and just waggle around freely? I've known people that have owned them in both manners, although they're very smart and the people I've known who didn't cage theirs often found that the ferrets could unlock doors and cabinets, get into food, figure out how to get outside, and tear things up. My one friend would keep his in a laundry room with a litter box when he was sleeping at night, but it was allowed out of the room anytime there was someone awake - daytime and evening. They eventually had to put a series of different locks on the door though because the ferret would spend all its time figuring out clever ways to escape. I have no idea about friend lists as I'm a techno phobe! As for ferrets they do pong a bit,especially in the summer ,and the boys mainly do. I have 6 at mo.but have as many as 20 before.They live outside in hutches. And I have owned ferrets for well over 30 years. As with the majority of ferrets in the Uk they are working animals and help me in my foraging exploits. I have shown them before,been a judge and written a lot of articles about them in the press.